Thousands of Portuguese people, unhappy with the austerity measures imposed by the government, have promised to again fill the streets of the country on March 2, 2013. The call for protest is gaining momentum on social networking sites, echoing what happened with the massive protests on September 15, 2012 and March 12, 2011 that helped bring down the last government. 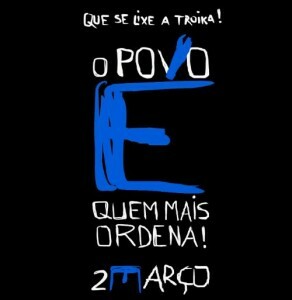 A number of protests are organized on Facebook [pt], where messages of discontent are multiplying. It is not time for blame. Many let themselves be fooled. Now is the time to mobilize against apathy and against the acceptance of collective suffering. It is time to abandon the television and soap operas and take to the streets to protest. It is time to participate in all kinds of protest, whether they be called by unions or by anonymous people. It is not time to see who is going or who is not going, it is time for us all to go. In an extraordinary move, the country's largest trade union federation, known as the General Confederation of Portuguese Workers, confirmed through its leader Arménio Carlos that union members will also take to the streets “with the people demanding new policies and a change of government”, as can be seen in this video [pt], made available by those in charge of the blog Aventar. The decision is remarkable, given that there is no memory of the union federation ever officially participating in a protest that it or one of its member unions did not organize. In spite of the little attention given by mainstream media, the protest came to public's attention thanks to a series of actions designed to stop ministers from speaking in some of their public appearances. For this, demonstrators have revived a historic song, composed and sung by Zeca Afonso, that was used as the second signal by the revolutionary coup that brought down Portugal's dictatorship on the night of April 25, 1974. The song, Grândola Vila Morena, became a symbol of the revolution and of democracy in Portugal. The demonstration was praised [es] on Twitter by journalist Jesus Maraña, ex-director of the Spanish newspaper Público and current director of the online newspaper infoLibre, who called it a “beautiful form of protest”. There is no democracy if the legitimate representatives of the people, elected by them directly or indirectly, are prevented from expressing their thoughts. Freedom of expression is the freedom for people to demonstrate, to protest, to contest, and to criticize. Freedom of expression ends in the moment when, by excess use of this freedom of expression, we prevent others from making themselves heard. Without the privileged space that all of these individuals above enjoy in the media, average and anonymous citizens have not given up on their forms of protest and strategy to silence the ministers. 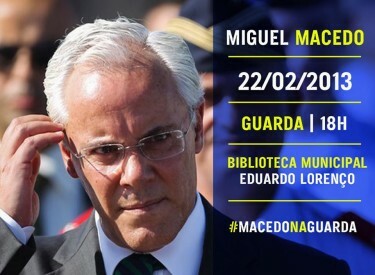 Poster disseminated on Facebook and Twitter, announcing the presence of Minister of Internal Administration Miguel Macedo in Guarda. Social networking sites continue to be used to call for actions and disseminate where numerous members of government will be present. Over the final weekend of February 2013, the minister of internal administration in Guarda and the minister of the economy in São João da Madeira were received with the revolutionary song, in spite of an increasing police presence. The song has already crossed the border into Spain, becoming a symbol of Iberian protest. Coincidentally, the composer of the song, Zeca Afonso, died 26 years ago, on February 23, 1989. To commemorate the date, Grândola Vila Morena was sung in the Largo do Carmo in Lisbon, the place where the 1974 coup reached its climax.